In this post, we examine five of the best-selling Udemy massage courses. These classes will not provide you certification, but are useful educational resources that do provide certificates of completion. Each state has different certification requirements- so be sure to do some research if you're trying to become a licensed practitioner. For more information about certification, check out the American Massage Therapy Association. In general, massage therapy is a technique of manipulating muscles, tendons and ligaments. There are a variety of different methods. People get massage therapy to deal with stress and anxiety or to heal from an injury. Udemy offers Massage Courses by video that help viewers become proficient in massage techniques. Students register for an account at the Udemy website and choose a course that interests them. As with most online courses, there are fees, but many people agree they are reasonable in relation to the quality of the instruction you get (Source). Buyers say online massage courses can be valuable resources for learning method and technique, but stress you will still need hours “hands-on” practice if you want to become proficient (Source). In this article, we take a look at 5 different courses offered by Udemy that are a mix of beginner and intermediate courses. Myofascial Energetic Release Deep Bodywork — In order to take this course, the student should be familiar with basic techniques. This course demonstrates the art and science of massage and how to achieve emotional release for your clients. Most reviewers say this course is a quick and informative introduction to this technique, however some said more focus on anatomy was needed. Overall it’s a highly rated course that should prove valuable to the beginner. The Isla Verde Spa Thai Massage Masterclass — Students of this course will get a certificate upon completion. Course is taught by Mark Perren-Jones who owns the Isla Verde Span and is regarded highly in the massage/acupuncture industry. Most reviewers rate this course highly and say the information was clearly explained and the skills taught were valuable if you’re planning on becoming a professional therapist (Source). 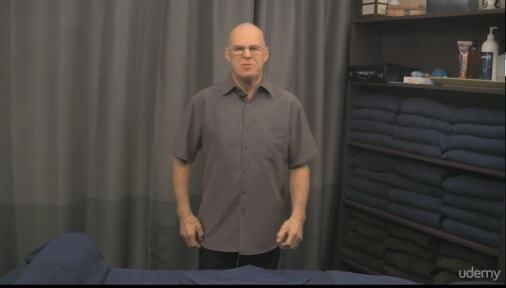 The Whole Body How to Massage Course by Brian Cavill — Geared toward giving beginners a good foundation of massage techniques and methods. Reviewers praise the instructor for his enthusiasm and ability to simply explain the techniques, although some wish there was more content and more in depth. The Isla Verde Spa Deep Tissue Masterclass — Another course taught by the respected massage therapist Mark Perren-Jones. Participants who complete this course get a certificate. This course teaches deep tissue massage, which is ideal for releasing chronic muscle tension. This course is designed for those who have some therapy experience. Reviewers say Mark is one of the best instructors and the course is worth every dime for those serious about becoming licensed therapists (Source). The Isla Verde Spa Relaxation Massage Masterclass — Last up, we take a look at one more class taught by Mark Perren-Jones. This one focuses on relaxation techniques, which are useful for those dealing with stress. Udemy says this is their number one massage course and users praise it for the techniques taught and how well Mark explained everything. This can benefit beginners as well as intermediate students. The Isla Verde Spa Relaxation Masterclass could be a good option if you who want to pursue a career in massage. Students like that the lessons are interesting and helpful, but there are minor complaints regarding the camera angles. This course aims to teach you how to perform a rubdown using correct body mechanics and give a client an incredible massage experience from the moment they walk into your room or spa. It is designed by Mark Perren-Jones, whose Isla Verde Spa earned an incredible 100 out of 100 5 Star reviews on Trip advisor. This online massage course might be a good choice for those who would like to make some extra money by giving massages. In general, students have a very good opinion of the Isla Verde Spa Relaxation Masterclass and they conclude that it is an interesting and informative course. They appreciate clear explanations and demonstrations, and overall find the lessons to be very helpful and easy to understand. However, there are complaints regarding the camera angles which could be improved as some finger transverse frictions on the upper back cannot be viewed clearly. If you’re looking for an online massage therapy class, you might want to consider the Isla Verde Spa Deep Tissue Masterclass. Students like the easy-to-follow lessons, but some do complain of the lack of thoroughness. This online course is designed for students who want to take their therapy practice to the next level. The founder of the course, Mark Perren-Jones, states that the lessons give powerful insights into the most important factors when giving a great deep tissue massage and offer clear instructions on how to perform the advanced massage techniques with great confidence. This course could be a good choice if you are a student massage therapist who is looking to master a greater depth of technique to use on their clients. In general, students state that the Isla Verde Spa Deep Tissue Masterclass course meets their expectations. They agree that the lessons are very informative and easy to follow, accompanied by good explanations. Most of the students find Mark to be a great teacher. However, some students warn that this is an advanced course and thus a lot of information is glossed over. The Whole Body How to Massage Course is a good option for anyone wanting to learn a method of massage that gets great results.Students find the lessons to be very engaging, but one states that they aren’t suitable for those who are already masseurs. The goal of this course is to set you apart as a massage therapist by the instructor’s proven and thorough method of massage. It was designed by Brian Cavill, a massage therapy instructor. He states that this affordable, thorough teaching is suitable for beginners, as well as experienced masseurs. This course might be a good choice if you are eager to learn a massage therapy that not only feels good, but is beneficial for the recipient. The general student consensus concerning the Whole Body How to Massage Course is that it is very informational and thorough. Students find the instructor to be very explicit and articulate. They agree that the lessons are really engaging. However, one online reviewer says that the course isn’t suited for those who are already professional massage therapists. The Award Winning Isla Verde Spa Thai Massage Masterclass is a good option for anyone who is looking for a certificate online Thai massage course. Students love how informative and insightful this course is, but some complain about the lack of instructions for stiff clients. The goal of this course is to teach you how to perform an incredibly unique Thai massage. By the end of it, the owner of the award winning Isla Verde Spa states, you will know how to use different techniques to relax the client and massage competently with a high level of skill. The lessons are designed by Mark Perren-Jones, best-selling instructor, pain specialist, acupuncturist, and masseur. This online massage course might be a good choice if you want to become a professional Thai massage therapist or to improve your existing massage skills. In general, students have a favorable opinion of The Award Winning Isla Verde Spa Thai Massage Masterclass. They agree that the instructions are clear, as well as that the lessons are very informative, insightful and easy to follow. Students appreciate that the lessons are shown with multiple camera angles to better understand practitioner positioning, as well as that the videos are available in HD. However, some students find that there is insufficient information on massaging stiff clients and those with lumbar chronic pain. If you are looking for a top-rated online massage course, you might want to consider the Massage Course, Myofascial Energetic Release, Deep Bodywork. Students like that the lessons are easy to follow, and so far have no major complaints. The goal of this massage course is to teach you the art and science of a massage, assisted stretches, joint mobilization, emotional release and awareness. Designed by Eryk Dobosz, co-founder and director of European Institute of Body Oriented Healing Arts (EIBOHA), the course is said to be of much assistance to those who wish to create a successful massage practice. This online massage course seems like a good choice for those looking to develop the knowledge, skills, and confidence to give a great massage to their clients. The general student consensus concerning the Massage Course, Myofascial Energetic Release, Deep Bodywork is that it is very informative and insightful. They agree that the lessons are well-recorded and easy to follow. So far, students haven’t stated any major complaint in their reviews. The only thing they suggest is adding a bit more anatomy and other massage terminology into the curriculum. Massage has various types, and if you understand the differences, it will be easier for you to choose the most appropriate and effective technique for alleviating your patient’s discomfort. In traditional , different levels of pressure are applied to the soft tissue of a human body— skin, muscles, ligaments, tendons, and fascia (the membrane surrounding the muscles) (Source). Although there are a number of specialized massage techniques used today, the most popular is Swedish massage, which is built around five strokes – effleurage (gliding stroke), friction (steady pressure), petrissage (kneading stroke), vibration or jostling and tapotement (drumming). There are types of bodywork, for example, craniosacral therapy or Reiki, that are a lot more subtle and work specifically on an energetic level. These are alternatives to the Swedish style, which is more physical. But there are many other specialized techniques that can easily be incorporated into Swedish styles. Most practitioners are specialized in several techniques and use them in accordance with Swedish in a typical treatment session for making a session that maximizes the experience (Source). To help you in choosing the right type of bodywork for you, the most popular and widely practiced modalities can be found below. The information can assist you to understand the main difference between the various healing modalities. Most importantly, you will be aware of your goals in getting a massage. Afterwards, you can interview a few practitioners, asking them which approach they would use for addressing your specific goals (Source). In case you have such a condition as whiplash or tendonitis, you can directly ask the practitioner if he/she is specialized in working on this particular condition and what style he/she thinks will be most effective for your case. This is a very good way to ensure that you will get the appropriate bodywork for you. The best known and most popular approach to bodywork is actually 'Swedish'. It is concentrated on improving the flow of blood to the muscle and skin and removing muscle tension. This type of massage provides generalized relaxation, as well as improves circulation, reduces stress, lowers blood pressure and enhances the overall state of health of a patient. It uses deep finger pressure and slow friction on body areas that are suffering from muscle tension or are aching or feeling contracted. This style of rubdown is useful for hypertension areas, such as sore shoulders or a stiff neck. Deep tissue work is highly effective when combined with the traditional Swedish arts. Muscles are covered by a very thin layer of tissue that is called”fascia”. It helps maintain body posture, as well as provides support for the muscles. Sometimes fascia can tighten in some places or can become stuck, constricting muscle and not letting it fully relax. With this form, the specialist gently stretches fascia all along the muscle to help the tissue release and get fully elongated. The effect of myofascial work is the relaxation of cramped muscles and postural improvements. This type is geared toward sportsmen and fitness enthusiasts. It is more vigorous compared to other forms of massage. It is used for warming up muscle tissue, assisting in training and preventing injury. Sports massage is used before and after exercise, and can also be used in the treatment of such sports injuries as sprains, tendonitis or strains. This one is based on the idea that all the organs in the human body are mapped to their feet and hands. This form applies finger pressure and movement to pressure those points that are on the feet for promoting healthy functioning of various organs of the body. This is a type of energy work. Reiki uses a set of hands-on holding positions corresponding to vital organs as well as nerve plexes in order to assist recuperative processes of the body and restore the mental piece. Reiki is very good for those who have anxiety or mood disorders. Nowadays it is gaining favor also with cancer patients. It works at body’s deepest levels and is very relaxing. This Japanese form of bodywork is rooted in the principles of Traditional Chinese Medicine, the same way as acupuncture. In both, the body is viewed as an interconnected net of energy pathways known as meridians. Blockages to energy flow can cause imbalances in case of which some areas get an excess, and others deficiency of energy. These blockages cause pain, tension, and diminished health. Shiatsu specialists use a combination of stretching, pressure and holding key points for treating these blockages and restoring a normal flow of energy in the body. This one is a very gentle, light, repetitive stroke, used for stimulating the activity of lymphatic system in which there is edema. This form is used for reducing swelling caused by an injury or surgery. Rolfing is a style of rubdown for body restructuring as well as movement education. It works mainly with body’s deep myofascial structures to release fascial adhesions as well as allow the bones and muscles to return to a balanced relationship. It is focused on alignment throughout the whole body – legs, arms, torso, etc. Rolfing is very good for cases of postural deviations. Heated basalt mineral stones or semi-precious stones are used for these treatments. These stones are believed to represent the chakras. As the smooth stone moves over the muscle, its tension is released. It is also widely accepted that Heated Stone Massage aligns subtle energies in the body resulting in harmony. This type monitors the rhythm fluid which is in a continuous process of draining and refilling around human brain and spinal cord. Monitoring the craniosacral rhythm, the specialist discovers where exactly healing is needed and is able to correct the sources of pain with very subtle manipulative techniques. Craniosacral Therapy is a very gentle hands-on technique which causes deep relaxation. Pregnancy massage is aimed at decreasing tension and swelling and increasing circulation for pregnant women. This style is practiced also with those women that have just given birth.